Where the Ghosts Walk | Take Home a Souvenir! It has been said that Peter Underwood, author of WHERE THE GHOSTS WALK has heard more ghost stories and spent more nights in haunted houses than any man alive. Dame Jean Conan Doyle used to introduce him to her friends as ‘the Sherlock Holmes of psychical research’. Do you believe in ghosts? Peter Underwood reveals some of the spooky sights he visited whilst researching his new book – perhaps you could pay a visit yourself, and then make up your own mind. This Halloween, WHERE THE GHOSTS WALK is your essential ghost-hunting companion. And it’s available as an e-book so you can download it now and start your ghost hunt straight away! Where do ghosts walk? Now there’s a problem. That they do walk this earth seems incontestable when considering the evidence. From every part of the world, in every civilisation, since the beginning of recorded history to the present time, there is good evidence of ghostly forms being seen by observant people with objective minds and healthy bodies. They are seen when least expected and usually to persons in a relaxed state of mind; but the fact that there are instances of a particular ghostly figure – be it a monk, a child, a nun or whatever – being seen at a specific place by different people, on different occasions by witnesses who have no previous knowledge that such a figure has been seen there previously, suggest that there is something about some areas that make it more likely that such a figure will be seen there and that there are indeed such things as ghosts that are sometimes seen by some people in some places. There are literally hundreds of books detailing ghost sightings in theatres, pubs, castles, private houses – even fires stations, police stations and ballrooms, but in WHERE THE GHOSTS WALK I have sought to recount reliable instances of ghosts being outdoors as opposed to in buildings. We examine haunted airfields, graveyards, bridges, woods and waters, to mention just a few. Discover places frequented by ghosts and ghostly activity that can be visited by anyone at any time. In this, my 50th published work, among the first-hand evidence I include is that of Prudence Pepper, a former ambulance driver with the London Fire Service who heard, time after time, the unmistakable sounds of planes coming in to land at deserted Davidstow in Cornwall. During visits to the airfield I heard many stories of seemingly inexplicable happenings, sounds of wartime activity, glimpses of wartime personnel, and other replays of long ago happenings. At the Cerne Abbas giant I talked with a young couple who had both seen four ancient figures on the giant hill carving, absorbed in some sort of primitive ritual; figures that abruptly and mysteriously disappeared in a puzzling fashion. At Honiton in Devon a haunted highway harbours a phantom soldier, thought to be one of Monmouth’s men who fled after fighting at Sedgemoor. He has been encountered by two school teachers and a party of schoolchildren, before suddenly disappearing. Cwmdonkin Park in Wales is haunted by its most famous son, Dylan Thomas; Greenwich Park boasts several ghosts; Swanage, Brighton and Isfield are only three of the haunted railway stations included; while ruins with ghosts include Corfe Castle, Caephilly, Margam and Netley. Among the seascapes are Boscastle, Beachy Head and Sandwood Bay in Scotland; while haunted woods and trees are to be found in London, Blandford Forum, Windsor and Northampton. All in all, the world is a strange place where, from time to time, ghosts walk. Happy Halloween from all of us at Souvenir Press! Things are getting spooky here in the office – and not just because the office poltergeist is up to his old tricks! Read on for a few recommendations that will make your Halloween spooktacular. Where the Ghosts Walk is a must-read for any would-be ghost hunter this Halloween. Packed with information including loads of places where ghosts have been seen outside – that is, places anyone can visit at any time – it is sure to have something in your local area. From haunted railways and roads, to abandoned airfields and old gardens, this is the “definitive guide to the haunted places of Britain”. The fiftieth book from the UK’s leading expert on the paranormal, Where the Ghosts Walk is the culmination of a lifetime’s work by Peter Underwood. So grab some friends, plenty of torches, and maybe a few snacks for the road… and get ghost hunting! Or if you’re easily frightened and would rather spend your Halloween curled up on the sofa than out looking for things that go bump in the dark October night, why not try a sample of Sad Monsters, a collection of short stories by Frank Lesser. Did you hear what happened when Megan Fox met Bigfoot? And what about that guy who went on a date with Medusa? Did you know that Son of Godzilla never calls anymore? Frank Lesser uncovers the softer side of some of the world’s most fearsome monsters, making Sad Monsters the perfect Halloween read for the easily scared, or those who are looking for laughs rather than upping the fear factor! Check out our Halloween newsletter for more spooky delights, and be sure to stock up on sweets for any trick-or-treaters who might be doing the rounds tonight! Chateau d’Hérouville*, once favoured by the biggest British recording artists including Elton John (the French chateau inspired the name of his ‘Honky Chateau’ album), The Rolling Stones, Cat Stevens, Fleetwood Mac and David Bowie, has been put up for sale this month. But it wasn’t just the musical great and good that frequented this French chateau. According to David Bowie, the Chateau d’Hérouville was haunted, and by none other than the ghost of Frédéric Chopin, who is said to have lived at Hérouville with his mistress. Bowie even refused to sleep in the master bedroom, due to the strange energy of the Chateau. But why cross the Channel for a spot of ghost-hunting, when here in Britain we have such a wealth of spooky places for you to explore! Where the Ghosts Walk by Peter Underwood is the culmination of a lifetime’s work from the UK’s leading authority on the paranormal. The book is a thorough guide to places across Britain where ghosts have been seen outside – that is, public places, not buildings or private houses, or French chateaux. If you’re after famous names, you can discover the ghost of Anne Boleyn in the grounds of Hever Castle in Kent and Napoleon at Lulworth Cove. You can also find screaming figures in Norfolk at Castle Rising, Kings Lynn, and at the Shrieking Pits in Aylmerton… and if you’re lucky you might even find a ghost train in Dunphail, Scotland. So instead of heading to France, take a ghostly tour of the British Isles under the expert guidance of Peter Underwood. *You can read more about the Chateau d’Hérouville on the Guardian website. What better way to end the working week than with a round-up of all the latest wonderful reviews and media attention that Souvenir Press titles have been attracting over the last week or so? Have a read of the most recent reviews, and please do let us know if you see any on the web that we’ve missed! Have you written a review of a Souvenir Press title and want it to be included in our next review round-up here on the blog? Leave me a message in the comments, on Facebook, on Twitter, or by email using the address in the Contact Us page. Are you ready to discover our authors? Things have been a little quiet here on the Souvenir Press blog over the last couple of weeks – sorry about that. I’ve been busy working away behind the scenes of the Souvenir website, and have been lining up some fantastic blog posts for you guys over the coming weeks/months. We’re going to be bringing back our Author Corner feature, and have currently got several of our authors scribbling away to bring you an exclusive view into their lives. Whether they’re sharing their inspiration, telling the story of how their book came to be, or sharing tips and advice, you won’t want to miss it! Our previous Author Corner posts featured Jessica Thom writing about her book Welcome to Biscuit Land, Richard Smyth on Bum Fodder: An Absorbing History of Toilet Paper, and Arthur Plotnik, author of Better than Great with a handy guide to terms of endearment for your loved one, suitable for Valentines Day and the rest of the year. 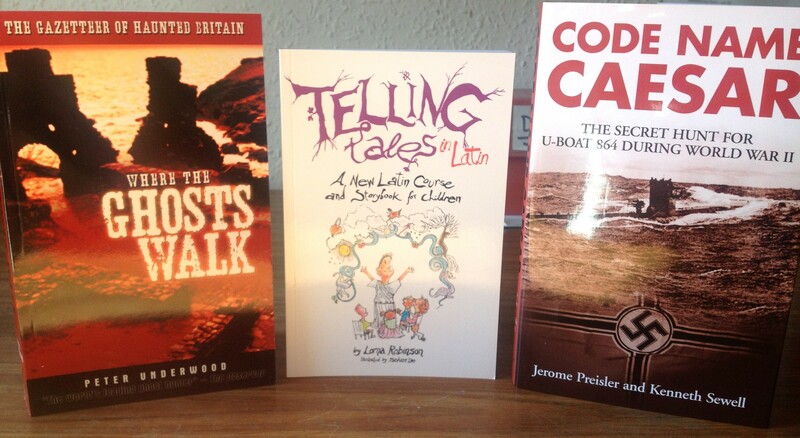 Away from the blog, we’ve had some exciting post this week: finished copies of three of our new Spring titles: Code Name Caesar by Jerome Preisler and Kenneth Sewell, Telling Tales in Latin by Dr Lorna Robinson (both published later this month), and Where the Ghosts Walk by Peter Underwood, published early next month. What do you think? I hope you all have a lovely weekend, and we’ll be back in the Souvenir Press office on Tuesday after the Bank Holiday. As always, if you’ve got any queries (Where can I buy these books? Can I get your books on my new Nook? Where’s the British Museum in relation to your office?) feel free to leave us a comment below, or you can drop me an email.